The thing that got me started comparing and tracking beer prices was the observation that it usually costs you more -- ounce for ounce -- to have your reusable growler filled at a brewpub than it does to buy disposable bottles that have gone through packaging, wholesaling, and retailing. This growler price penalty is apparently due to the fact that bars have a different business model than bottle shops and groceries. But there's a related pricing issue that doesn't make any sense at all: the disparity between the retail prices of 22-ounce bombers and 12-ounce bottles sold in 6- or 12-packs. Don't start in on me with comments like "if you want it, just pay the price, otherwise shut up". I'm not saying that no bomber is worth the price. But it is worth pointing out that: 1. The exact same beer costs more in big bottles than in small ones, and 2. Similar products such as soda pop or liquor are priced in the opposite way -- bigger packages cost less per ounce than smaller ones. To illustrate the point, I'll show you the price difference for a few beers I saw recently at a big grocery store in Portland, and also a similar comparison of Coca-Cola prices (Pepsi prices were identical). We'll use the legal tender of It's Pub Night: the U.S. dollar and the Six-Pack Equivalent (SPE). For each of the above beers, I took the lowest big-bottle price and compared its SPE to that of the lowest small-bottle price. That highlights another aspect of the bomber trickery: bomber prices are marked down less frequently than 6-packs or 12-packs, which are on sale almost every single day at big groceries. In case you're worried about apples-to-apples comparisons, even if I use non-sale six-pack prices for those matchups where the bombers weren't marked down, the bomber penalty is still 80 cents for Deschutes and $1 for Widmer, though Sierra Nevada did fall into line with about a 52-cent discount. 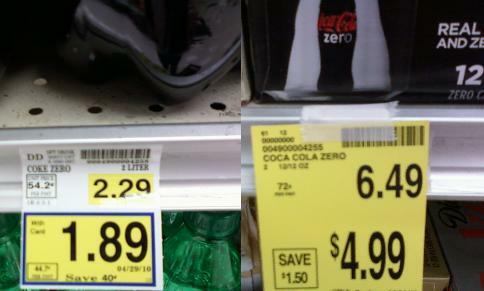 Nor was the Coke pricing a fluke -- there was a similar discount at several groceries around town. By the way, even though I translated the cola prices into SPE, the grocery shelf tags at most stores give you comparison prices in pints. Kind of backwards -- I usually think of cans of pop, and pints of beer. Spread the word about the bomber price penalty. The fact that no other product is priced with a volume penalty instead of a volume discount leads me to believe that bomber pricing is simply a swindle. Even at the ShadyBeerStore sale price of $2/bomber the SPE is $6.55...not bad for 10 Barrel's Sinister or Ninkasi, but still a bit more than the usual grocery store sixer on sale. Price aside, I've always looked to bombers for beers that are in a limited run. Ninkasi/Hopworks/Roots/etc. are exceptions, though maybe the regular output of these smaller breweries is comparable to what Deschutes or Full Sail considers a limited edition. It feels weird to buy a bomber of Mirror Pond...like buying a fifth of Knob Creek in a fancy wooden box. @Dave: Yeah, I sometimes have to put a paper bag over my head when I see a bomber of Mirror Pond or Widmer Hef. It just seems like a hallucination. But I think bombers of everyday beer like that are just taking advantage of the price confusion. Maybe it's even helping push all beer prices higher. @Patrick: Thanks for bringing some erudition to the debate! I'm not sure I buy your explanation, though (left kind of a tedious comment over there saying why not). If I am considering purchasing a beer that is "new to me", which tends to be fairly often, I'm going to automatically look for the 22oz. Why? Because no matter the oz/cost comparison, the initial "buy-in" for a bomber is still less than a 6 pack. I've only invested around $5 instead of around $10 to find out if I like the product or not. Yes, you pay more per oz, but if I dislike the 22oz, at least I'm not committed to drinking 5 more, or having them sit in my fridge. So, I'm willing to trade convenience and fridge space for a little more $/oz. Zak: But if the beer is available in both 22's and 6-packs, your cheapest, smallest option is to buy a single 12-ounce bottle from the 6-pack. ...IF buying a single 12oz bottle is an option. Not all stores offer broken sixpacks -- in fact, most don't. But you're right -- the difference in price doesn't make any sense. But I still maintain that the penalty of buying a 22oz is generally worth the lower initial price investment. Sometimes I say, 'Damn, I wish I had more of that," but most of the time, I don't.